This is My Teacher Costume: Monorail Blog Crawl: Do You Believe in Magic? 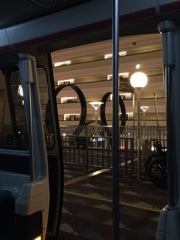 My blog post from Disney's Contemporary Hotel, on this monorail blog crawl I'll created for myself will be written a little differently than I intended. I planned to sit by Mary Blair's mural. 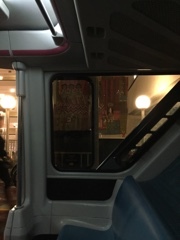 Instead, I'm on the last monorail of the night, passing said mural and posting from the Blogger app on my phone. Things don't always work as I plan them. This was a pretty spontaneous plan and I didn't take transportation schedules into account. One of my favourite aesthetics is retro future, which makes the Contemporary one of my favourite buildings on Walt Disney World property. It is one of the places that I feel Walt in. It matches his original EPCOT feel, and though it's outdated, I love what Walt's 70s version of the future looks like. For me, a structure like the Contemporary feels like magic. I know that it won't have the same feeling to everyone. To me, It feels like a place that was built with a specific story in mind - the story of an optimistic, clean and efficient future. It also feels frozen in time. The building's architecture is very obviously outdated and attempts to update it interfere with the feel of it. Aside from repairs, I'd prefer if Disney embraced the retro-futurism and went all out with the outdated future theme. I would like to see more elements of Walt's original EPCOT vision come to life in this hotel, as well as a resurrection of the Monsanto House of the Future (which, incidentally, I was discussing today with an educator who got to visit it). The feeling of magic that I get visiting the Contemporary comes from, I think, a combination of nostalgia and wonder. I have a soft spot for the things that influenced me most heavily between the ages of 7-10. The things I feel in love with then hold such a special place in my heart and memory. Visiting EPCOT Center in those years left me astonished and inspired. The images and experiences I had there have always stuck with me. The future EPCOT Center promised me (like the one in Back to the Future) is the one I'm still waiting for. To create magic for others, I like to do lots of little things. Right now, I'm waiting to see the impact of a little piece of magic on my cousins. In researching my book, I discovered one of my favourite ideas of all time. A parent describes "Tink Treats." They noticed that their children, upon visiting a Disney park, wanted to purchase souvenirs in the gift shops on property. If you've visited such a place, you've probably noticed, and commented, incredulously, about the prices. There is no denying that the theme parks are a revenue stream for Disney, and the merchandising game is strong. To combat their kids' requests and complaints, this parent devised a magical system of "Tink Treats." While their kids were out of the room, they placed pre-purchased (from a dollar store) items (many of them Disney branded, but only costing a dollar each) in their hotel room. Along with the surprises, they left glitter. The children learned that Tinkerbell visited their room and left them special treats for their next day of holiday. This reminds me of the feeling a child gets after the Tooth Fairy (or Santa, or the Elf on the Shelf) visits. Wonder, amazement and magic. My past three Disney trips have been accompanied by Tink visits. She left treats for Gillian and Stephanie before Edcamp Magic in 2015. They shared a lot of their treats with kids they met on buses on Disney property. It's not hard to identify them as teachers. She left treats for my #DisneyCAST team: Ashton, Charlie and Travis/Tracy. In fact, the package they received at check-in and the Tinkerbell suite upgrade (to, literally, a Tink themed set of rooms) left them thrilled, puzzled and believing in magic. Tonight, Tink left a letter and treats for my little cousins to prepare them for their Luau tomorrow. I am eagerly waiting for a text from them, sharing their news. When was your imagination captured so that you felt wonder and magic? How may we do the same for the people we work with: students, colleagues and parents?